Pork chops smothered in pan gravy and onions. ATTENTION! Oh, hi. That actually worked! Just wanted to make sure you read this before you skip down to the recipe because this photo does not do the recipe justice! I've cooked this three times now and it’s turned out perfectly each time but I haven’t been able to get a photograph that captures how totally amazeballs this recipe is! The pork chops are fork-tender, the flavor is incredible and the gravy is velvety and delicious! And it’s so easy! For anyone that’s ever struggled with making gravy, this is the easiest recipe E V E R ! This was an experimental dish that I thought would work but I wasn't 100% sure. And like I said, I've made it three times now and it’s turned out perfectly every time! Holla! If you like this recipe be sure to check out these Garlic Baked Pork Chops! Season both sides of pork chops with salt, pepper, garlic and oregano. Heat oil in a skillet on medium-high heat until hot. Sear pork chops in hot pan on each side for approximately 3 minutes on each side or until nicely browned. Remove pork chops from pan (we're not cooking them through, just searing them). Add onions to hot pan, season with salt and pepper and sauté for 2 minutes. Reduce heat to medium then add flour to the onions. Stir to coat onions with flour and continue cooking for 2-3 more minutes, stirring occasionally. Slowly add chicken broth to onions and stir until smooth and mixture begins to thicken. Taste for seasoning then add salt and pepper if necessary. Reduce heat to low, add pork chops back to pan then cover and cook for 30 minutes to an hour (you want to see a slight simmer – bump the heat up a notch if you need to). The longer you cook it, the more tender the pork chops will be (so long as you don’t let them boil – keep it at a simmer and you’ll be ok!). Read about the difference in boiling and simmering here. Serve gravy over pork chops and rice or mashed potatoes. Thanks!, just made the smothered pork chops, the gravy tastes good. I used beef broth instead I didn't have chicken broth and I added a little cream " half& half " to light in up. I also used red onion. I am not a gravy maker. My side dish was mashed potatoes and salad. The recipe maes the gravy mentioned. The problem with adding cream soups is that they are super high in sodium, even the 'reduced sodium' types. For those that want or need to control how much salt is in their food, the only reliable way is to make the gravy yourself from scratch using sodium free chicken stock. So glad you brought up about the soup issue. Ialways foumd too salty,and husband wont touch it if he finds out there's soup in it. Not a big fan. I'm looking forward to making this tonight it sounds great. Thank you for your entry. I love smothered chops. I have always dredged them in flour, browned them in a small amount of oil and then made the gravy after removing them from my skillet. I will try your way and see if there is a big difference in the result. These sound fantastic and I'll definitely be trying these soon. Pinning. I love that there is no canned soup. Thanks for sharing! We love these! I'm making them tonight for the 5th time since finding this recipe! Thank you to the person that posted this recipe! I like to make the gravy/smother sauce for this using Campbell's Cream of Chicken Mushroom Soup. Which is kind of hard to find. I've never seen this, but why not mix together 1 can of cream of chicken and 1 can of cream of mushroom. If it makes too much gravy, you could divide it before putting in pan, and freeze it for next time. I finally saw this for the first time ever a week ago and that was at walmart. But I would say 1 can of cream of chicken and 1 can of cream of mushroom would be the same. After many time of cooking with soup, I have decided I just don't like the taste. I will definitelt try this recipe. Sounds so good. Campbell's Cream of Mushroom with Roasted Garlic makes a delicious gravy/sauce, too! Can't wait to make this one. I made your pork chop casserole recipe a few weeks ago and it was a huge hit. I also made the picnic pasta salad for the 4th of July weekend and that was also a huge hit. Thanks for sharing such wonderful recipes Mandy. Cannot wait to make this for the boyfriend this weekend, looks delish!! How can you tell once the pork chops are completely done cooking? Thanks! I'm glad you liked it! And I couldn't agree more about the creamed soups! Can you finish cooking them in the oven? Yes! Absolutely!! I almost wrote that in the recipe but since I haven't tried it personally and couldn't guarantee the results, I didn't. I'd cover the pan tightly then bake at 325 for an hour or so. If you try it, let me know how it turns out! I did exactly that tonight and it tasted great, but the gravy ended up a little thin so I had to add some cornstarch slurry to thicken it up. Not sure if that was from baking it or what... Any input? When you simmer that long with an unlidded pan, you get more evaporation than you would with a covered pan in the oven. Thus the thinner sauce. you could also,place the porchops,and gravy in a slow cooker to finish tenderizing,they will be fork tender. CAN YOU USE CANOLA OIL INSTEAD IF VEGEATABLE OIL FOR THIS RECIPE? VEGETABLE OIL IS SO BAD FOR ME THE DOCTOR SAID. Absolutely. I actually use canola oil myself. Adding a can of GOLDEN MUSHROOMS to this is excellent too! Absolutely! I've never made it myself so I'm not sure about cooking times. I'd try on low for 6 hours or high for 4. Let me know if you try it! I can't wait to try this in my low pressure cooker! I was thinking the same thing! I wonder how long it would take? I'm thinking 20 minutes. You have me craving pork chops now! To Barb, add a little Gravy Master to darken the gravy. You ain't lived if you haven't jacked up a pan of gravy or two in your day! Wonder if this would work with boneless chicken breasts? I have made the pork chops and they turned out great!! I had the same thought about chicken and I tried it and the chicken tasted just as good as the pork. The chicken only took 45 minutes on simmer. Hey again from North Georgia! Just wanted you to know that I was able to South My Mouth gluten free style! I took this recipe and made a couple of easy substitutions and successfully made it dee-lish with no gluten. It already had no dairy, so it's good to go for me! Thanks! I used king arthurs measure for measure gluten free flour. Worked perfectly. We love pork chops BUT mine always turn out tough and dry. Any suggestions anyone? Slower cooking or lower temp cooking. .Slow cooking is always more tender on pork ..And center cut chops.Better cut of meat.. I have been searching high and low for a smothered pork chop recipe that doesn't call for a can of creamed soup-this was fantastic! I added some sliced green peppers in once I set it to simmer. My pork chops are always tough-like every time I've tried to make them-and these turned out perfectly :) Was a hit! Glad to hear that! And, I'm with you... I'd much rather leave out the creamed soup when I can. Thanks for writing! I made this for dinner last night - third time. Delicious! Had a package of two really large bone in pork chops so thought I would try this recipe even though it calls for more chops. Just cut back on seasoning and put in the oven to finish off. They were Delish and will keep this in my favorites forever thanks for sharing this love it. My husband mr picky said they were amazing thanks! Making this now. I like a lot of gravy so I added a little more flour and broth, however I do like to make gravy with milk so mine is a little lighter than yours. I would be interested to see how it would be with cream of mushroom as well. Thanks for the recipe it looks great. I can't wait. Made these last night. They were awesome! Since my cast iron skillet was not big enough for all four of the chops I had, after searing them and making the gravy I put them in a 9x13 in the oven at 350 for an hour covered with foil. YUMMMMMM. Thank you for yet another awesome recipe. We cannot use commercial canned soups and frankly dont like the taste anyway. Good rounded comfort food recipe! Absolutely amazing! All three of my guys devoured this dinner. Thank you for sharing!! How would I make this without using onion? I'm not fond of onions but I can tolerate a slightly onion flavor so we made this basically without onion by removing the cooked onion after the 2 minute sauté but before the addition of flour and it turned out fantastic. If you are allergic to onion and can't even tolerate the subtle flavor of onion you could try omitting "Add onions to hot pan" Move on to the next step of adding flour to the oil & drippings in the pan (making a roux) then do the rest of the recipe as written with "cooking for 2 - 3 minutes more ..." I haven't tried it but I bet it would be great - just a slightly different flavor. Let us know! This was sooo good! I replaced the flour with cornstarch to make it gluten free! So easy and delicious! Thanks for the recipe! This was FANTASTIC!!! Some of the most tender pork chops I've ever had. Thanks!! I have made this probably 4 times in the last 3 months and it has got to be one of the best things I've ever tasted! I've paired it with roasted potatoes, mashed potatoes and with rice. It doesn't matter what is on the plate next to it, those chops are incredible!! My husband calls the gravy 'good enough to drink!' This one has won the prize! I can't wait until later this summer when I can get all happy and throw some fried okra up next to these bad boys and just watch my taste buds burst into song!! Super easy to make! Thank you for the recipe! I love that I'm not using a canned soup to make the gravy!!! Thank you for printing a great recipe without using canned soup. Canned soup has to much salt for me and my husband is gluten free. This works great. I use my homemade (low sodium) chicken broth and it was wonderful. Forgot to add I also use GF flour and tossed in some fresh mushrooms. You can splash in some cream to make it richer. So if you 1/2 an onion and then cut them in slices (like 1/2 an onion ring), that seems like a lot of onion. Why don't I see any onion in the gravy in the picture? Do you strain them out at some point? Thank you! I don't think it's too much onion but you can use less if you like. I pulled the chop out of the gravy and didn't ladle more gravy on. You can see the onion on the rice. I have been using this exact recipe for years. It was one that I just made up on my own. I was astounded that pork chops make the most AMAZING gravy. If you are on the frugal side or are simply out of chicken broth, simply up the seasoning and use water for the gravy. It will still be delicious. I have made this recipe twice now and I love it! 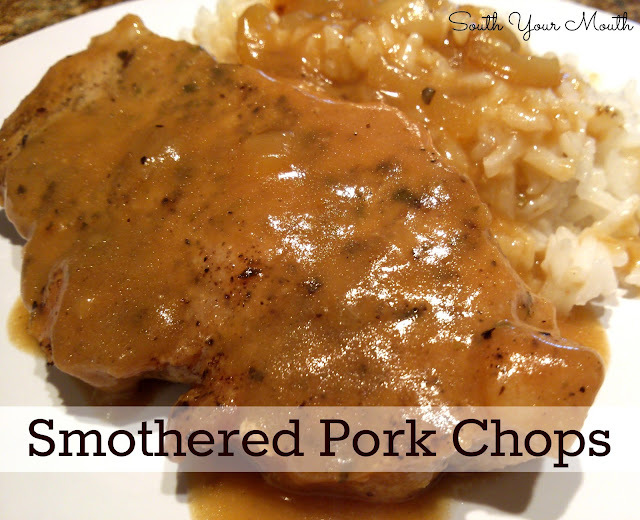 I've been looking for an easy recipe for smothered pork chops, and this is it. I will NEVER make them any other way. Thanks for sharing! I don't know why you think the picture doesn't do justice. It looks sooo good, I want 'scratch & sniff' plus 'lick & taste' capability on my computer. It's going on my list next week. It would have been immediately, but grocery shopping is done for the week. And I agree, it's good to see a smothered recipe that doesn't include canned cream of 'something' soup. From freezer to table in under 2 hours tonight...and only one complaining kid (out of 5)...this one can definitely be added to our large rotation of dinners! Yum! Thanks! I made this just last week and added mushrooms and garlic in with the onions. I used a recipe that I got from an old issue of the Cooking Club magazine. I've not used any other recipe for pork chops since I found the recipe. It's just delicious. I season the pork chops really good and fry them in lard. Yes lard,, very tasty. No can soup. I use all purpose flour for gravy,, I season that also. My picky son loved these. They came out great and were very easy. Made this tonight for dinner, it was excellent. Made it exactly as listed. Served with garlic mashed potatoes. I wouldn't change a thing. I used boneless pork loin chops, and simmered them for 30 minutes. Me and my family thanks you for this recipe! AMAZING! Funny, I’m going to make these tonight. I’ve just come back from a raid on one of my favorite places, Four Oaks Farms in Lexington, SC. I got some nice pork chops, sausage and of course, their country ham; best on the planet. I’m with you on the gravy; au natural: No Cream of Sodium soup. If I want a ‘chem-coction’ I’ll go to the ‘Fallen Arches’ or the ‘Bugger King.’ This is the way my grandmother taught me how to make them, way back in the 50’s. The only difference is that I dredge them first in seasoned flour: And sometimes a little ‘Slap Ya’ Mama, (Mary at Deep South Dish got me hooked on that stuff). Then, instead of oil, I use bacon drippin’s. How disgusting, bacon grease: Said no one ever. I usually use either a vegetable stock, to keep it neutral, or pork stock to richen the flavor. To take the worry out of the possibility of breaking the roux, heat the stock to about 120 deg. or so, then add it to the roux. I don’t know about you, but I just hate it when my roux breaks. Boy, that’s painful. This can be finished in the oven. Simmering starts between 185 – 195 deg. F. Set the oven to about 235 deg. F., for about an hour or so. Check to see that it’s not boiling. Ovens differ as do cooking vessels. So keep an eye on it. The finished temperature should be 145 deg. F. And yes, the longer it cooks the better it is. This is the best recipe ever. We follow the recipe exactly except we found that using a pork tenderloin cut into medallion is the best. It is also great w/ chicken. Company worthy!!! People, you need to try something besides canned soup!!! It all tastes the same...like canned soup. Try something different and infinitely better. At least make the soup from scratch. This recipe is killer. I tasted it before serving (of course) and my family is lucky they got any.. I could drink this gravy. Thank you! I have been making these chops for years but I can't have onions so I use a combo of about 2t Parsley and 1t Paprika, it makes up for the taste of the onion...tastes better to me. I dredge my chops in seasoned flour and lightly brown them before adding the liquid and spices them turn down heat and simmer until tender and gravy is made. My fiance doesn't like onions so I use the minced onions you get in the spice isle in the store. He doesn't know the difference. Going to try these tonight. They sound really yummy. Did you use bone in porkchops? Made these for dinner tonight and they were so tasty and the gravy was incredible. I try not to use canned creamed soup anymore and this was a perfect recipe for smothered pork chops that didn't use cream of something soup. I have made the recipe exactly as written several times. I have made it with bone-in and boneless sirloin chops. It is absolutely wonderful every time! Thank you so much for sharing this recipe. Made this last night and it came out amazing! I was never really good at making gravy and was usually a hit and miss with the porkchops. Sometimes tender and juicy and other times tough. I actually cut them out of dinner rotation until the husband and kids asked for porkchops. I followed your recipe to the T and wouldn't change a thing. Love how the chops are seared with seasonings only and not drenched in flour. Fall off the bone tasty. Thanks so much! Oh! And the simmer vs boil blog helped too! I've never had smothered chops or even made them, so this was my first. I loved them. The chops came out delicious and so did the gravy. Next time, and there will be a next time, I want to try adding mushrooms and a bit less oregano. Overall, excellent. I have similar recipe and a problem watching things on the stove. I solved this problem by putting on the lid and putting pan in oven for an hour. Making this today, third time. They are sooo good and easy. I make them in my crock pot, love them with mashed or rice. Made this today and it's delicious... and easy! Even my picky eaters loved this. There's no need to add a cream of whatever soup to this. Thanks for sharing this Mandy I will definitely make this again. Followed the recipe, bumped up the amounts for a bigger crowd...18 chops! At the point where you cover and simmer, I transferred it all to the large crock pot and let it simmer for 5 hrs while we went about the day. Excellent! mmmmmmm good my husband & I could not get enough.I made mash potatoes & green beans to go with it. And I have to agree it does NOT need any stupid soup. Just leave it as it is. I’ve made this twice & it’s turned out perfect both times!! Only thing I add is a can of mushrooms with the onions. I serve it with mashed cauliflower for a low carb meal! Thank you, thank you, thank you!!!! I made these tonight and they were delicious! The only thing I changed was the addition of about half a cup of mushrooms. I cooked them with the onions and the gravy came out SO GOOD! I had been craving a savory dish and this definitely fulfilled that craving. I served it with mashed potatoes and peas. Both kids cleared their plates! Thank you for posting this! Made these tonight, baked in the oven. FANTASTIC! The gravy alone is to die for!! YAY! I'm so glad you enjoyed it!! I have made this twice since I found your recipe and I love it! So do my parents (and my dad is a picky one). My mom is not a huge pork chop lover but she would not stop going on about this recipe. Thank you! Made this tonight and the pork chops turned out amazing. I added about a tbsp paprika to the onions for even added flavour, and while I could have turned them off at 30 min., I left them in for another 15 and it made a huge difference to the gravy and the aroma. This one's a keeper. Made these tonight. Amazing recipe. A few modifications: added about 1 tbsp of paprika to the onions. Used arrowroot flour instead of regular flour, just as effective without the gluten. Used organic chicken stock instead of the canned stuff. Simmered for 45 min. Hello :) I just LOVE this recipe! Is there anyway to make this 'for a crowd'? (Not a HUGE crowd, just a small 'crowd') :) I'm limited on the stove top, but didn't know if it was an option to possibly finish in the oven, or even chop up boneless pork chops after browning, and then simmer stove top in the onions/gravy? Thank you so much for this recipe! I have been cooking for at least 30 years and never have been successful with making gravy. I followed your instructions, using what I had on hand (red onions, beef broth, fresh rosemary & parsley). It came out wonderfully! My mother who passed last year, made this when I was a child. When I saw it, it immediately brought back warm and fuzzy memories. This is a great recipe and very easy to make. My husband loves gravy and this is a definite keeper. Thank you.